An injury-hit Hemel Hempstead Town side slumped to a 3-0 home defeat against Bishop’s Stortford in the second round of the Herts Senior Cup on Tuesday night. The scores were locked at 0-0 at half-time, but Bishop’s Stortford dominated the game after the break to secure a deserved win. 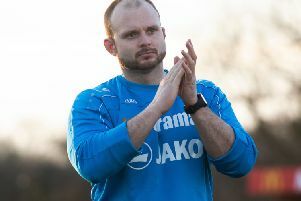 Ex-Chelsea defender Steven Watt came straight into the Hemel starting XI for his debut, while former Tudor David Hutton was named among the Bishop’s Stortford substitutes. After a quiet first 10 minutes, Bishop’s Stortford came close to breaking the deadlock whan Omar Rowe stepped up and curled a delightful free-kick over the wall and against the crossbar with Tudors keeper Jamie Butler well beaten. Neither side was creating much, but Hemel had their first effort on goal in the 40th minute when Ben Herd curled a free-kick a couple of yards wide of the post. The visitors were first to try their luck in the second half as Rowe’s volley went wide of the near post, before they broke the deadlock in the 50th minute. Morgan Ferrier did well to cut the ball back from the byline, where Kieran Bywater was on hand to nod the ball into an empty net with Butler stranded. That sparked Hemel into life briefly as Wilfried Gnahore saw his shot deflected onto the outside of the post, before Mo Shariff fired a decent effort narrowly wide. But it was Bishop’s Stortford who struck next to double their lead on 67 minutes as Ferrier again crossed, and this time it was Rowe who was on hand to apply the finishing touch from close range. The result was put beyond doubt in the 72nd minute as Rowe curled home a third for the visitors to compound Hemel’s misery. Jack Smith and Kyle Connolly forced visiting keeper Tom Lovelock into his first saves of the night inside the last 10 minutes, but that was as good as it got for Hemel. Hemel Town: Butler, Herd (Johnson, 79), Connolly, Watt (Colm Parrott, 79), Jules, Spring (Fitzgerald, 30), Smith, Richens, Gnahore, Shariff, Husin. Suns not used: Findlay-Bada, Brooks. Bishop’s Stortford: Lovelock, Gayle, Herd (Vanderhyde, 70), Ekim, M’Boungou, Allen, Labonne (Buchanon, 70), Beere (Abdullah, 78), Ferrier, Bywater, Rowe. Subs not used: Merrifield, Hutton.